Y-90 is a treatment option available at Bethesda Hospital East for patients with liver cancer. 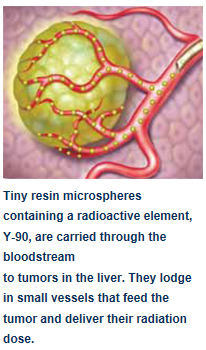 SIR-Spheres® microspheres are tiny particles, about one-third the width of a human hair, that contain the radioactive isotope yttrium-90, or Y-90, and can be delivered directly to liver tumors. Bethesda is one of only 12 cancer centers in Florida, and the only one in Palm Beach County, to offer SIR-Spheres microspheres. Selective internal radiation therapy (SIRT), also known as radioembolization, is similar to other interventional radiology cancer therapies such as radiofrequency ablations and transarterial chemoembolization (TACE) in that it is a minimally invasive, imaging-guided procedure. Interventional radiologist Richard N. Edelstein, M.D., with Bethesda Radiology Associates, performs the minimally invasive, outpatient procedure. Using a small incision in the groin, Dr. Edelstein places a catheter in the hepatic artery leading into the liver. Once in place, millions of the microscopic radioactive particles are injected. With precise intra-arterial placement, the microspheres are delivered to the tumors, limiting the impact on healthy tissue. In addition, many precautions are taken to minimize the risk of microspheres traveling to other organs. Am I Eligible for Y-90 Treatment? Many times, surgery is the first-line treatment for liver tumors. Another common treatment is chemotherapy, delivered systemically through the blood stream, or internally directly to the liver. Several criteria are used to determine if a patient is a candidate for Y-90, such as the level of liver function. Additionally, the cancer must be limited to the liver, or at least the majority of the disease should be limited to the liver. As the use of Y-90 microspheres continues to grow and more data is available, it may become part of the standard first line of treatment for liver tumors. Current studies are exploring the combination of standard systemic chemotherapy with selective internal radiation. In the world of cancer research, it bundles big hope in millions of microscopic packages. For more information about Y-90, call the Imaging Department at 561-737-7733, ext. 84577.